In the summer of 2015, Phil Wilder, Treasurer Rios’ high school American history teacher, sent her an e-mail to congratulate her on her efforts on the currency redesign process and to share his observations. He said that after 35 years of teaching at Moreau Catholic High School in Hayward, CA, he walked into his classroom that morning, the first day of the school year, and noticed for the first time that there were no images of historic American woman on his walls. He thanked Treasurer Rios for not only making a difference in his classroom but for making a difference in the largest classroom, the nation itself and said he would make some changes. 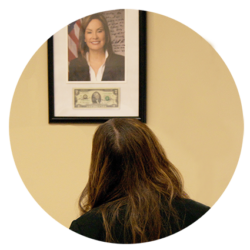 Treasurer Rios visited the school later that fall and there on Mr. Wilder’s walls were images that included Susan B. Anthony, Harriet Tubman, and even Treasurer Rios, all captured on video in front of a classroom of very enthusiastic high school students. Mr. Wilder’s passion to make a difference inspired Treasurer Rios to model his actions on a national platform and continue the public engagement discourse beyond currency design. In addition to history classrooms, schools can also focus on other subjects such as math, science, art, literature, etc. The goal would be to highlight women and men who have made significant contributions.